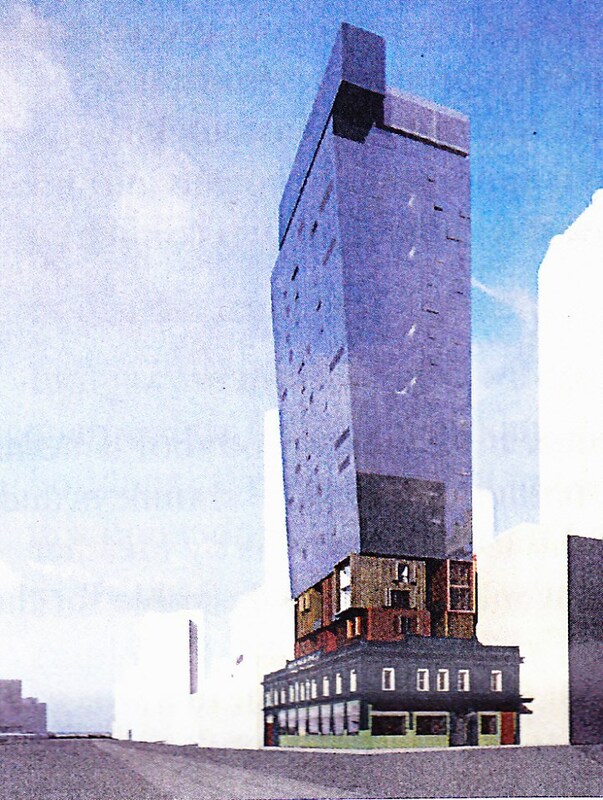 Plans to partially demolish the old Fletcher Jones Building on Flinders/Queen Streets and construct a 25 level building. Nice shape to it, something different for Flinders Street. I hope the podium facade is given a polish up too. It's not a 'podium', Andrew - it's one of Melbourne's significant heritage buildings. The building is in a heritage overlay and deserves more respect than being utilised as a podium (literally 'foot') to a new, and frankly uninventive, tower. The original plans exist for the Queen Street side - why not just reconstruct to the original design rather than an "interpretive" design? Also, what does the condition of the interior have to do with how you treat the heritage building into the future? If that was a relevant argument for overriding heritage considerations, we would barely have a Victorian building standing in Melbourne today. Another case of facadism, only two walls left standing, sigh....its a building, not a stage set. Culture Kings is currently on this site. Does this mean they will have to relocate? Is that the rejected proposal? That is the amended version that was considered by VCAT (no decison yet). Substantial improvement over the original plans. Went to VCAT in August I believe, they submitted new designs which involved rebuilding the Queen Street facade, so these would be the updated plans. Wow. Compare the pair. Doesn't it just shine through when a developer respects rather than merely complies with heritage retention? For mine, that's absolute rolled gold best practice. Hope they win with this. Though looking closer is that tower basically constructed rising right behind the facade? I'll reserve further judgement pending what they're proposing internally. But I really hope this sort of thing becomes significantly more common under the new regime. "Ok, you've got a heritage structure there. If you set back appropriately from that, we can waive plot ratio, northbank overshadowing, etc"
Sadly Adam, only the skin deep facade on Flinders St, and the laneway will be actually kept, and though theres nothing left inside to see, its still got the original elevated floor levels and perhaps some internal 1870s brick walls, the new internals will be different floor levels and only just disgise teh fact that its only external walls from inside......and the tower is setback, a goodly 7m on Queen Street (increased) but only 3.5m on Flinders (not so good), and then it leans out until the top reached the boundaries, which is you know pushing the boundaries. The new no-overshadowing northbank or even 15m north of that would make this one about half the height, which they would probably still do if it had already been in force ! That is a pretty disjointed 'podium' Why not extend the glass all the way down, or at least keep a similar design. Is this a facade or are they actually restoring the building? They are restoring the exterior of the building back to the way it was in 1955. 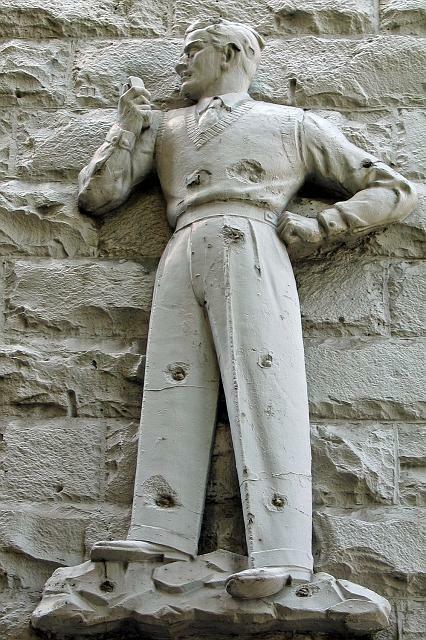 A close up of the Fletcher Jones man that is still in-situ in Tavistock Place at the rear of the existing building. 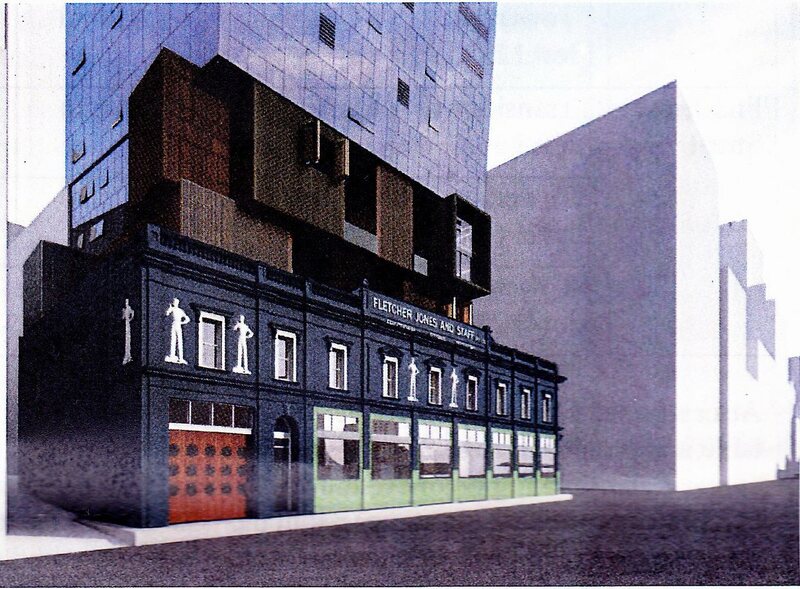 The Malaysian owners of the former Fletcher Jones showrooms on the corner of Flinders and Queen Streets in the Melbourne city centre have sold the 144-year-old building for $18 million to a local development syndicate, who has plans for a hotel on the historic site. The sale delivered a healthy return to investor Creative Wealth who paid $11 million for the building at the end of 2012, secured hip streetwear brand Culture Kings as a tenant until January 2017 and secured a permit for a 25-storey tower of 72 apartments and penthouses. The off-market sale of 1-5 Queen Street was negotiated by Larry Takis and Adam White of Teska Carson, who declined to comment. It's understood the new owners – a local developer and a funds management partner – will seek to have the permit modified to allow for a hotel on the 746sq m site. 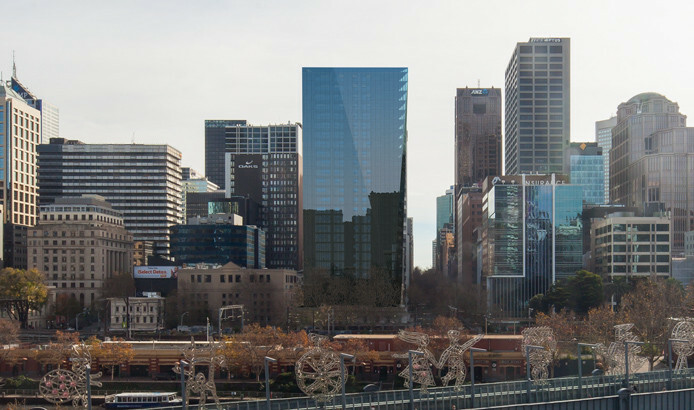 If approved it would join a growing number of CBD and city fringe sites that have shifted in use from apartments to hotels to cater for an under supply of accommodation amid rising visitor numbers and following a tightening of city planning controls.